Nothing seems to make women today more angry than when I write about women being keepers at home as if mothers being home full time with their children is a horrible idea. 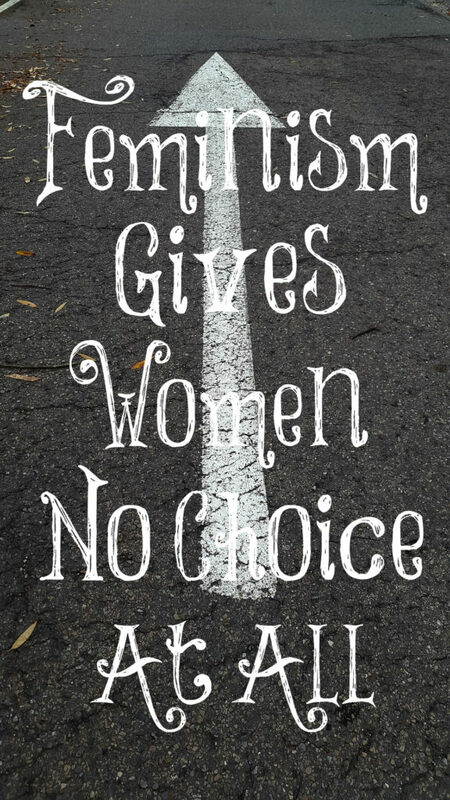 They try to convince me that feminism only wants to give women a choice and it’s good but I don’t ever believe them. An article called Feminism Has a Ferocity Problem explains why feminism doesn’t give women a choice at all. Feminism’s desire is to turn women into men and men into women, plain and simple. They don’t like it when an older woman like me tries to encourage and convince younger women to be homemakers, bear children, be help meets to their husbands, and find joy in doing these things. No, this is completely against their agenda so they fight me on it every chance they get. They’re afraid I’m going to set women back a century or two and cause women to act like women (feminine) again. No, it’s not part of their agenda at all! Godly women want nothing to do with ferocity and being ferocious; demanding their way, loud, and stubborn. They have no desire to be like men and do what men do: have careers that take them away from home all day to provide a living for their families. No, they want men to do this so they can stay home and care for their families and homes. With the depression rate in women rising 400%, we all know that feminism is a big, fat failure and it makes no one happy at all. Let’s all go back to obeying the perfect Word of God and find contentment in our marriages, our children, and our homes, just where the Good Lord wants us to be. For those of you who say you “have” to work and have no choice, do you trust God? Do you believe that His “commands are not burdensome”? Do you believe He is our Provider and that NOTHING is impossible with Him? If you answer “yes” to all of these questions, then why do you not trust God to provide for you so you can be home full time with your family? Wow, what a terrific post. You are so spot on that feminism, at its core, really does seek to give women no choice. I don’t come across too many women who seem to be happy and, at the root of it all, is their push for power and control. Women will never be at peace being in control because God doesn’t reward women who are choose to live outside of His will. Amen, TJFW! True peace only comes from the LORD and living out the roles that He has for us. No choice indeed! There is nothing more frustrating than not being able to use the talents that God has graciously given to me. The talents He has given to us, Sarah, are to be used for His glory and for what He has called us to do, not what we want to do with them. Many women preachers use the excuse that God has gifted them with the talent to preach but if God forbids women to preach, then they should not be using them in this way. We need to diligently seek out His Word and He is clear how He wants us to live our lives. You’re welcome, Katy! I love the truth of His Word. Superb article Lori, well said. Lori, How was your Resurrection Sunday? Thank you, Lori, for this post. I really needed to read this because I feel like getting a job outside the home because my dear hubby is recovering from a heart attack still. I worry about the bills getting paid. So instead I’m teaching myself to sew and then I can sew for other ladies. I hope the little bit I’m learning will eventually bring in some income. There’s a YouTube video I watch when I start to worry called Step Back, Let God Do It. One has to like black gospel music to appreciate it though. Anyway, the song reminds me to not try to take control away from God but to step back and trust Him. Do you have any other suggestions for work at home jobs? I love this so much!? While I do agree that sometimes there is no choice but for a woman to work, I am SO BLESSED that I am able to stay home. I am one of those people who has wanted to be a mom and wife since I was very little. I do love every minute of it! It saddens my heart greatly when people don’t understand that this is ALL I want to be. I had a friend’s husband tell me “when the kids are in school, you need to get a real job or career to find your identity!” I was annoyed. I boldly said, “No need! My identity is in Christ and being a wife/mother!” It also saddens me-and angers me-when women who claim to be strict feminist look down on my choice. Telling ME that I am “setting women back 100 years” and that my daughters will resent me for this choice. WHAT?! Isn’t ‘feminism’ about a woman’s right to decide? I guess that’s true only if it’s THEIR choice!